In November 2005 Karen Matheson OBE released her first solo album of Gaelic material “Downriver”. The album is a simple, mainly acoustic affair… providing the perfect platform the vocal delights that have stunned audiences around the world and introduced the beautiful Gaelic language to countless thousands of people. Supporting this will be live shows throughout the UK with backbone group from many of her solo recordings – James Grant (vocals and guitar),Donald Shaw(piano and accordion) and Ewen Vernal (double bass) with special guests along the away! 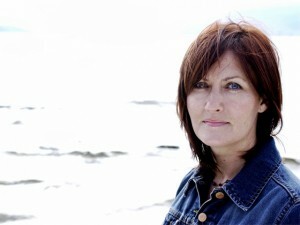 Widely recognised as the haunting vocals of Celtic supergroup Capercaillie, Karen has just been given an OBE in the 2006 New Years Honours list, an astonishing achievement to add to her award of ‘Best Gaelic singer’ from the inaugural Scottish folk awards – just two of many plaudits earned from a career which began with her performing as a child in her local village hall on the West coast of Scotland. Downriver is Karen’s third solo album. Her second – ‘Time to Fall’ – was released in June 2002….a collection of songs that brought her mesmerising vocal beauty to the fore, confirming her status as one of the most respected singers worldwide. ‘Time to Fall’ differed from Capercaillie’s traditional folk repertoire. Much of the album, including the title track, reunited her with the compelling song-writing of James Grant (ex Love & Money) – a relationship developed on her debut solo album ‘The Dreaming Sea’. Also included on ‘Time to Fall’ are a host of superb guest musicians including the BT string ensemble and vocalist Tim O’Brien, with production from Donald Shaw and Paul McGeechan and mixes by Calum Malcolm (the Blue Nile). As a solo performer, Karen has been involved in various projects of collaboration including the award winning BBC series Transatlantic Sessions, where she recorded tracks with Emmylou Harris, The MacGarrigle Sisters, Nanci Griffith, Paul Brady and a host of respected musicians. She also recorded and toured as lead vocalist on Heritage de Celts, a supergroup project in France, produced by Donal Lunny and Dan Ar Bras that sold half a million albums and culminated in a sold out concert at Bercy (17,000 capacity) in Paris. More recently she has been collaborating with James Grant in special concerts and TV appearances (having guested on his solo albums ‘Sawdust in my Veins’ and ‘My Thrawn Glory’), and recorded songs for Norway’s multi-platinum artists Secret Garden. All materials © 2012 - 2019 Capercaillie and Survival Records. Site by Reefnet.